Toronto stands as one of the most beautiful cities in Canada. It is known as a city perfect for raising children. The main reason for everything Toronto has to offer you. It’s a perfect combination of a modern city full of natural beauty. If you still haven’t decided whether to buy a home in Toronto, learn more about the best Toronto neighborhoods for families. If you are looking forward to moving to Toronto, keep reading. You will find some interesting facts about the best Toronto neighborhoods for families. However, moving with a family implies having some organizing skills and a to-do list. Whether you plan to move locally in Toronto or you are relocating from overseas, professional movers Toronto can help you a lot. If you don’t have time to pack and transport your belongings, there will be there to help you. This way you will have more time to spend with your family. Another thing that it’s highly advisable is to talk to your children about moving to a new home. 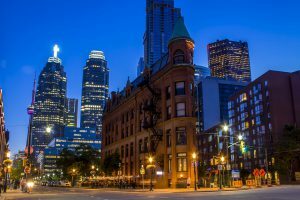 If you are moving to Toronto for the first time, let your kids find out some interesting facts about the best Toronto neighborhoods for families. Keep reading to get more information about the best places in Toronto to live as a family. Find out more interesting facts about the best Toronto neighborhoods. This is one of Toronto neighborhoods for families that has a great public education. The most popular one is Allenby Public School which has student speaking both English and French. This school is famous for its successful inclusion of foreign students. This neighborhood is great for both parents and children since it has many green areas where you can spend the entire day with your family. Recreational facilities are all around, and the wintertime in this Toronto neighborhood is amazing. Since the Eglington park is located in the city of this neighborhood, all sorts of sports activities are available for children of all ages. If you would like to live close to the famous High Park, you should know that this is one of the best Toronto neighborhoods for families. This part of the city has a very close community and a vibe of a small, independent town. Many praised schools are nearby, and families usually stick together to raise children the best way possible. On the other hand, parents can easily find a time to relax by themselves. There are plenty of local shops and shopping centers as well as fine dining restaurants. The best part of this neighborhood is the Hide Park, wish spreads over 160 hectares. Besides many family recreational spots and walking areas, you can take your kids to the zoo and enjoy the day! This neighborhood is located along the Lake Ontario. It got its name from the four beaches it has all along the lake. Besides excellent schools, The Beaches is a perfectly safe neighborhood to raise children in. 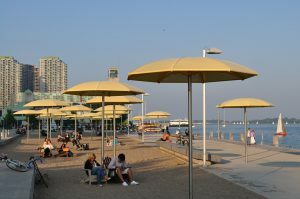 If you like living near the water, Toronto beaches are perfect for your family. If you are looking to rent a home in Toronto suburbs, Don Mills might be just the right place for you. It’s located a little bit further from Toronto center. Still, this neighborhood has plenty of good schools. Some of them are famous for implying Montessori system, as well as including French-speaking children. If you want to raise your child near the most beautiful city in Canada and still the peace and quiet, Don Mills is the perfect Toronto neighborhood for you. If you are looking for a place that has it all – it’s Bayview village. Raising children in this neighborhood is a great choice since the community is very family-oriented. Also, many family hospitals nearby have an excellent reputation. For those who would like to stay in the comfort of the city center, Davisville can be a perfect neighborhood to raise a family in. It is located near the downtown of Toronto and many young and busy parents choose for their new home. The reason is simple – it has everything the city has to offer so your children can enjoy many afterschool activities. Did you find a job in the downtown of Toronto? This might be a great place to find a new home for the entire family. Many young and busy parents choose Davisville for their new home. In the end, we should not forget the Humber summit neighborhood. This one is famous for so many parks around that you’ll need few months just to get to know all of them. Another benefit of living in Humber summit is the renting of homes – they seem to be pretty affordable. Moreover, they come more affordable than in most other neighborhood in Toronto. When it comes to education facilities, Humber summit is home to many great schools. Some of them are Gracedale and St. Roch. Whichever school you choose for your children you won’t regret it. This area is famous for many different cultures. You can find a wide range of ethnic diversity everywhere you go, including public schools. After you choose the are in Toronto you want to live in, make sure to contact your movers. This is highly recommendable in case you are planning a long distance relocation to Toronto. If you organize your move well, you’ll have more time to prepare your entire family for the upcoming change. Professional movers can help you pack, organize the entire moving process and transport all of your belongings safely to Toronto. Make a list of pros and cons and make sure to find the best area in Toronto to move with your kids.